Send them something appetizing straight to their inbox. Delivered by standard, express or courier post. Add a premium wallet to make it extra special. What can I use my physical or digital gift card for? You can use your gift card for food and beverages at any participating restaurant whilst dining. Where can I use my physical or digital gift card? You can use your gift card at any of our participating restaurants Australia wide. We are adding new and exciting restaurants everyday, which can be found here. Can I use my gift card at all restaurants listed in the Gourmet Traveller Guide? Gourmet Traveller Gift Cards are accepted at participating restaurants that can be viewed here. These do not necessarily include all restaurants featured in the Gourmet Traveller Guides and can include other restaurants. How do I use my physical or digital gift card? Present card at your chosen participating restaurant at time of payment and the amount will be deducted from your bill. If you have spent more than the face value of your gift card, you will need to pay the remaining amount by other payment methods. If you have spent less than the face value of your gift card, the amount will remain on the card for next time you choose to use it. Are there any restrictions on when I can use my physical or digital gift card? There are no restrictions on when you can use your gift card; they are accepted anytime 7 days a week whilst dining in. What is the difference between a physical and digital gift card? Physical gift cards are plastic gift cards which can be purchase at leading retailers or online. Gift cards purchased online are posted to you or the recipient and there is the option to add a premium gift wallet. Digital gift cards can be purchased online and delivered electronically via email to you or the recipient. Digital gift cards can be printed at home or shown on a smartphone at time of use. Do I need to activate my digital or physical gift card? Physical gift cards must be activated prior to use. Digital gift cards do not need to be activated and will arrive in your inbox ready for use after payment has been processed. How do I activate my physical gift card? Physical gift cards must be activated prior to use by visiting activate gift card and following the prompts. How long until I can use my physical gift card once I’ve activated it? Once a gift card has been activated online, it can take until midday the following business day to be active and ready for use. If I want to use my physical gift card on the weekend when do I need to activate it? Gift cards are only activated on business days; if you plan to use your card on a Saturday or Sunday you will need to activate you card by the Thursday night prior. How do I buy a physical or digital gift card? It's easy! Visit one of these leading retailers and look for the big gift card stand or buy online today. At Gourmet Traveller Gift Card, we accept Mastercard, Visa, American Express and Diners. All payments are protected by SSL (Secure Sockets Layer) and Secure Data Encryption. All credit card payments are processed in real-time for your security and immediate peace of mind. Gift cards can be purchased for $50 and $100 denominations from leading retailers or purchased online for $50, $100, $150 and $200 denominations. Postage and handling of physical gift cards are $9.95 for registered post and $19.95 for courier. Delivery of digital gift cards is free. What will be sent to my recipient? If you have purchased a physical gift card, your recipient will receive a letter with your personal message (optional) and the gift card. You can also make their gift extra special by adding a gift card wallet for $2.95. If you have purchased a digital gift card, the recipient will receive an email addressed to them with a personalised message and link to their Gourmet Traveller digital gift card. How long does it take for a physical or digital gift card to be delivered? Physical gift cards are dispatched within 48 hours after payment is processed. For standard delivery please allow an additional 5-7 business days; for registered post please allow an additional 2-3 business days; for courier please allow an additional 1-2 business days. Please note: In peak periods such as Christmas, due to intense activity at Australia Post and/or other delivery partners, additional delivery time may be required. Digital gift cards are dispatched instantly after purchase. Some email servers can experience delays so please allow up to 24hours for the digital gift card to appear in your inbox. Do physical & digital gift cards expire? Yes, both physical and digital gift cards have a 3-year expiry from 1st April 2018. The expiry date can be calculated 3 years from date of issue, which can be found on the card or you can check the expiry date online by visiting check card balance. Once expired, your card is void and cannot be used. Gift cards ordered PRIOR to the 1st of April 2018 have a 12-month expiry. Gift Cards ordered on or After the 1st of April 2018 expire after 36 months. Can I check the balance of my physical or digital gift card? Once you have activated your gift card, you can check its balance online by visiting check card balance and following the prompts. Alternatively you can contact customer assistance on 1300 664 965 and we can assist in checking the balance for you. If there's money left on my physical or digital gift card can I get the balance in cash? Unfortunately, gift cards are not redeemable for cash. What if my physical or digital gift card does not work at the restaurant? • Your physical gift card has not been activated and/or allowed the necessary time for it to become active (midday the following business day). You can activate your gift card here. • The balance you have nominated is not available. You can check your card balance here. • The restaurant you have tried to use your gift card at is not a participating restaurant of the Gourmet Traveller Gift Card program. You can view our participating restaurants here. Gift cards ordered PRIOR to the 1st of April 2018 have a 12-month expiry. Gift Cards ordered on or AFTER the 1st of April 2018 expire after 36 months. You should treat an activated card as if it were cash. If the card is lost or stolen, please phone 1300 8664 965 immediately, so the card can be disabled if purchased online. We will not reimburse you for any transactions conducted by an unauthorised person prior to you informing us of the card’s loss. You will be protected from any subsequent loss if you satisfy certain conditions including supplying your receipt as proof of purchase. Can I top up the value on a physical or digital gift card? Gourmet Traveller Gift Cards are not reloadable. Can I use my gift card in conjunction with other promotional offers? Gourmet Traveller Gift Cards cannot be used in conjunction with any other promotional offer unless otherwise advised by the individual restaurant. Please check with individual restaurant prior to your visit. Yes, a SSL certificate secures gourmettravellergiftcard.com.au and Braintree Payment Gateway processes all transactions. What if I am experiencing issues with a gift card purchased second hand or from an uncertified third party seller? Our gift cards are available for purchase from specific retailers - the list of certified sellers can be found here. We cannot guarantee the validity of any gift card you purchase from any other retailer - including any auction website or discount website who is not listed as one of our certified sellers. Any gift card not purchased from a certified seller may be fake or counterfeit or associated with fraudulent activity. Gourmet Traveller Gift Card will not be liable to you or any other person for any loss arising from any purchase of our gift cards from a retailer who is not listed as a certified seller. How long is my promotional card valid for? If you received a physical gift card through a promotional please refer to correspondence provided to you with your Promotional Gift Card. Why do I have to pay for a replacement/lost/stolen card? The replacement of a lost or stolen card is at the discretion of the card distributor (Edge). A fee is charged to cover the cost of the Gift Card replacement & administration required to replace the gift card. When I purchased my gift card a particular restaurant was a participating venue online, they are no longer listed on your website. Can I still use my gift card at that restaurant? Only participating Restaurant partners are able to accept your Gift Card. If it does not appear on the website as participating you will need to select another restaurant that is participating to be able to redeem. What happens if I changed my mind or have made a duplicate order? Please ensure to double check your order prior to submitting it. Exchanges or refunds will not be issued for change of mind or duplication of an order. For more information please refer to the full terms and conditions for further information. What happens if I have not used all the funds when the Gourmet Traveller Gift Card expires? Once the gift card has expired the remaining value will no longer be available. We encourage you to use your gift card before it expires. The FAQs didn't answer my question, what's my next step? Sorry the FAQs didn't answer your question. We would love to hear from you and help you to find the answer! Please click on the Contact Us and let us know how we can assist you further. Physical gift cards are dispatched within 48 hours. For standard delivery please allow an additional 5-7 business days; for registered post please allow an additional 2-3 business days; for courier please allow an additional 1-2 business days. Please allow extra days for deliveries just before Christmas, due to intense activity at Australia Post and/or other delivery partners. This website at https://gourmettravellergiftcard.com.au/ (the “Website”) is owned and operated by Edge Loyalty Systems Pty Ltd (ABN 96 138 299 288) (“Edge”, “”we”, “us”, “our”). This document contains the terms and conditions governing your use of the Website and any order or purchase of a product (which may include physical, plastic or digital gift cards - collectively “Gift Cards”) offered for sale via the Website (“Terms and Conditions”). By using the Website you accept these Terms and Conditions by accessing or using any part of the Website after you have first accessed a page providing a link to them. You are welcome to print a copy for your records. If you decline to accept these Terms and Conditions, you will need to exit this Website immediately. These Terms and Conditions are in addition to any terms that apply to the use of any Gift Card purchased from or issued by Edge or to any related services. You are responsible for the use of this Website by anyone who uses it in connection with your Gift Card. You fully indemnify us in respect of all use of this Website by you, with your consent or in connection with your Gift Card, except to the extent that we have expressly authorised that use. For certain campaigns, promotions or contests, additional terms and conditions may apply. If you want to participate in such a campaign, promotion or contest, you need to agree to the relevant terms and conditions applicable to that campaign, promotion or contest. In case of any inconsistency between such terms and conditions and these Terms and Conditions, those terms and conditions will prevail. The Website and its contents are subject to copyright (“Content”). The copyright is owned or controlled by Edge or, in the case of some material, third parties. You may view this Content and make a reasonable number of copies of parts of this Website solely for personal, non-commercial use. Any other use, including the reproduction, modification, distribution, republication, display or communication, of any Content is strictly prohibited. This Website contains registered trademarks and other trademarks that are protected by law. Except as expressly authorised by us in writing, the use of any of these trademarks is strictly prohibited. You will not hack into, change or otherwise interfere with the operation of this Website or any information contained within it. This Website may contain links to third party sites. Edge and its related companies are not responsible for the condition, security levels, content or any other aspect of any third party sites. The links are provided solely for your convenience and do not indicate, expressly or by implication, an endorsement by Edge of such third party sites or the products or services provided, advertised or otherwise mentioned on those sites. To the maximum extent permitted by applicable law, we make no warranties or representations about this Website or the content on this Website, including but not limited to warranties or representations that they will be complete, accurate or up-to-date, that access will be uninterrupted or error-free or free from viruses, or that this Website will be secure. We reserve the right to restrict, suspend or terminate without notice your access to this website, any Content, or any feature of this Website at any time without notice and we will not be responsible for any loss, cost, damage or liability that may arise as a result. Except to the extent required by applicable law, neither Edge nor its related companies, affiliates, directors, officers, employees, agents, service providers, other contractors, successors or assigns will be liable for any losses, damages, liabilities, claims or expenses (including legal costs and defence or settlement costs) whatsoever, whether in contract, tort (including negligence), statute or otherwise, arising out of, or in any way related to, the use of this Website or any site linked to it. This limitation applies to all direct, indirect, consequential, special, punitive or other losses, damages, liabilities, claims or expenses you or others may suffer, including for loss of profits, business interruption or loss or corruption of data or information. Our liability for a breach of a condition or warranty which is implied by law and cannot be excluded is limited, to the maximum extent possible, to one of the following at Edge’s option: the supply of the goods or services again; or the payment of the cost of having the services supplied again or repaired. This Website is provided for use by Australian residents only. Your use of this site is governed by, construed and enforced in accordance with the laws of Victoria, Australia. Disputes arising from your use of this site are exclusively subject to the jurisdiction of the courts of Victoria, Australia. This Website may be accessed throughout Australia and overseas. Without limiting the above disclaimer, Edge makes no representations that the content of this Website complies with the laws, including intellectual property laws, of any country outside Australia. If you access this Website from outside Australia, you do so at your own risk and are responsible for complying with the laws in each place where you access the site or where anything you publish or upload can be accessed. These are our current Terms and Conditions. We may at any time vary these Terms and Conditions by publishing the varied terms and conditions on this Website. Where a change may place an unfair burden on existing users of the site or services, we will provide a form and period of notice that we reasonably consider appropriate to that change. These Terms apply to all Gift Cards issued by Edge. "Card Number" means the number that appears on the back of your Gift Card. "Gift Card" means the gift card or digital voucher that you have purchased or received or any other gift card or digital voucher we may issue. A reference to "you" or "your" is a reference to the person who is in possession of the Gift Card at the relevant time for the purposes of these Terms, or who authorises another person to do something with or to the Gift Card on their behalf. Gift Card products can only be purchased from us by using credit card or PayPal and include GST where applicable. If you make a booking to redeem your Gift Card with any retailer and provide Gift Card information but fail to attend the booking, the retailer may choose to redeem the value of the booking from the Gift Card according to their own trading terms. We shall not be responsible for any such redemption and you must deal directly with the applicable retailer. We are not liable for the goods or services you purchase with our Gift Cards. Any purchase made with a participating retailer constitutes a transaction between you as the holder of the Gift Card and the relevant retailer. You acknowledge and agree that we are not a party to that transaction, and is not in any way responsible or liable in relation to that transaction. Any dispute about goods or services purchased with a Gift Card must be resolved with the retailer. If you think there has been an incorrectly processed transaction on your Gift Card please contact the retailer where the transaction took place. We are unable to reverse transactions approved or processed by any retailer. Gift Cards can only be used whilst dining in at a participating retailer. You acknowledge that we may allow access to the services offered on this site to anyone who enters a valid Gift Card number and 4-digit PIN. Your PIN is simply our way of identifying you. It does not offer you any protection or security if your Gift Card is lost or stolen. Remember to treat your Gift Card like cash. You are solely responsible for any loss caused by use of your Gift Card and PIN by you or any other person, including any use not approved or contemplated by you. You must notify us immediately by calling our Customer Service Team on 1300 664 965 if you know or suspect any unauthorised use of your Gift Card. Both physical and digital gift cards have a 3-year expiry from 1st April 2018. The expiry date can be calculated 3 years from the date of issue, which can be found on the card or you can check the expiry date online by visiting check card balance. Once expired, your card is void and cannot be used. If purchased before 31 March 2018, your gift card will expire 12 months from the date of purchase If purchased on or after 31 March 2018, your gift card will expire 36 months from the date of purchase. Any expiry date for an individual Gift Card can be checked at any time online at https://gourmettravellergiftcard.com.au/checkcard. Gift Cards purchased at retail outlets must be activated prior to use as per instructions on the back of the card and pack. To activate your card go online to the Website http://gourmettravellergiftcard.com.au/Activate) and follow the prompts by entering the card details. Once activated, funds are available from 12pm the following business day though may be available sooner. Funds can be checked at any time by visiting the Website (http://gourmettravellergiftcard.com.au/checkcard). Treat your Gift Card like cash. Lost or stolen cards will not be replaced or refunded except in our sole discretion. There is a $10.00 per card replacement fee if we choose to replace any Gift Card. Can I request a replacement my Gift Card? Yes, you can request a replacement gift card by contacting Customer Service. There is a $10.00 per card replacement fee. You're responsible for the use and safety of your Gift Card. You are liable for all transactions on your Gift Card, except to the extent to which there has been fraud or negligence by us or by any of our employees. Gift Cards cannot be redeemed for cash, reloaded, returned for a refund, have their balances consolidated to a new gift card, or be replaced after expiry and are not legal tender, account cards, credit or debit cards or securities. Cash will not be given for any unused amount. Gift Cards are available for purchase from specific retailers – the list of certified sellers can be found http://gourmettravellergiftcard.com.au/HowItWorks#Retailers We cannot guarantee the validity of any Gift Card purchased from any other retailer including any auction website or discount website who is not listed as one of our certified sellers. Any Gift Card not purchased from a certified seller may be fake or counterfeit or associated with fraudulent activity. Edge will not be liable to you or any other person for any loss arising from any purchase of our Gift Cards from a retailer who is not listed as a certified seller. If you have received a Promotional Code, you must enter the code given into the designated ‘Promotional Code’ field in the shopping cart for the discount to be applied for the applicable Gift Card. One Promotional Code applies per transaction. We reserve the right to remove any Promotional Offer or Promotional Code without notice at any time. Promotional Offers are only available on purchases made on websites owned or controlled by us. Our Privacy Notice explains how we handle the personal information that we may collect from you with respect to Gift Cards. If you do not have a copy and are unable to access the notice online http://gourmettravellergiftcard.com.au/Terms), please call 1300 664 965 for a copy. These Terms are to be construed and enforced in accordance with the laws of Victoria, http://gourmettravellergiftcard.com.au/Terms Australia. Any dispute arising from your receipt or use of a Gift Card is exclusively subject to the jurisdiction of the courts of Victoria, Australia. 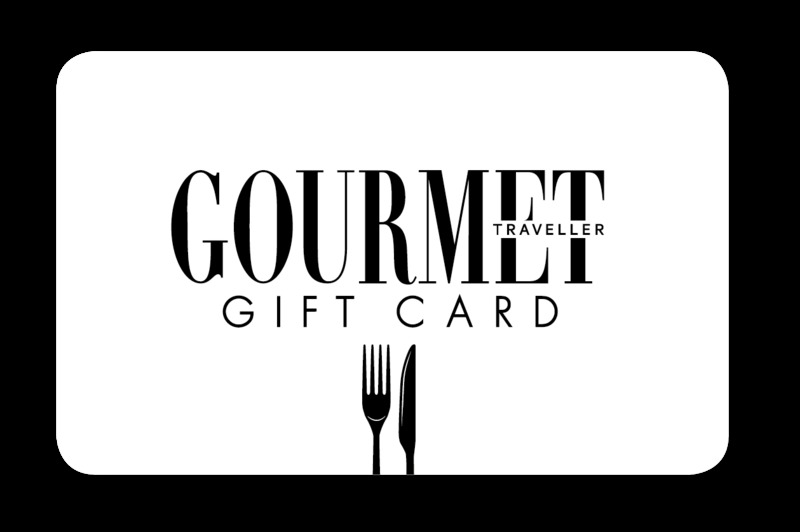 Gourmet Traveller Gift Card will not provide a refund or exchange for change of mind or duplicate orders. If the gift card is found to be faulty, defected, and is significantly different to the image or description provided, a full refund or exchange will be provided upon proof. Please keep your receipt as a proof of purchase. The Good Food Gift Card does not compensate for errors or duplicate orders that have been made on your part. Please ensure to double check your order prior to submitting. Your latest client has just given you the go-ahead on a recent proposal. A long-term partner has just hit a milestone, their 50th order with your company for the year. Or that big new lead has just put their faith in your team’s capacity to deliver. Whatever the specifics, nurturing lasting business relationships is done most elegantly by giving more than you gain. An unforgettable fine dining experience is the perfect way to show your appreciation, and it couldn’t be easier for both you or your client. Bottles of wine or spirits can be tough to get right, and there’s little sadder than a gift collecting dust (or getting splashed with coffee) on display in the office common area. A Gourmet Traveller Gift Card, with its wide selection of meals at a choice of premium restaurants, will be the kind of thanks your client will adore. With a pre-loaded Gourmet Traveller Gift Card, you’re spoiling your client with their own choice of preferred taste and style, and a great food experience will be that much more special for it. It’s the kind of freedom that is always appreciated because your client can treat themselves to their own idea of an incredible night out. And everyone loves to talk about their incredible night out (and you and your business is likely to get more than a few mentions). Australia’s leading restaurants have partnered with the Gourmet Traveller Gift Card program because they know the premium dining experiences they provide are ideal for the sort of people you’d want to reward. You can have the utmost confidence your client will be taken care of in a way that befits the appreciation you want to show them. Gourmet Traveller Gift Cards can be sent either via email, redeemable on a smartphone; or as a physical gift card, with the option to be packaged in a premium wallet. The credit is your client’s to do with what they wish at any of our restaurant partners, either as a partial payment or for the full amount if it’s less than the card value. And better yet, any remaining credit can be used at any restaurant at a later date for up to 3 years after issuing. The Gourmet Traveller Gift Card is designed to be your no-nonsense gateway to thanking whomever you want with a truly stellar culinary adventure. Our corporate gift cards aren’t just a piece of plastic. We’re able to add your own branding to give your gift a personal touch that is sure to have an impact and be remembered. And if you really want to get ‘Gourmet Traveller’ fancy, we can handle bulk orders, promotions, and reward strategies and become your gift-giving secret weapon. Enter your details below to learn more about our corporate options or to place an order. A member of our helpful corporate sales team will get in touch to fulfil your order quickly, and handle any questions you might have.